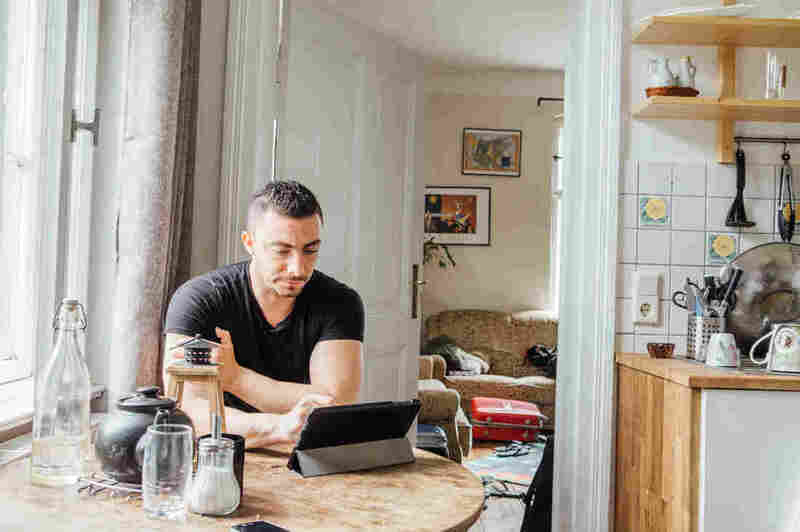 Refugees In Berlin Are Trained To Counsel New Arrivals From Syria And Other Conflict Zones : Goats and Soda For Ahmad Chahabi, reaching the safety of Germany was only the first step. Today he's drawing from his own experience to help the newly arrived. Ahmad Chahabi (left) chats with a newly arrived refugee in the shelter where he himself used to live in the south of Berlin. Chahabi is now a peer counselor. A few months after fleeing war in Syria for safety in Germany, Ahmad Chahabi was at Berlin's main bus station. As he waited for a friend, he saw a child get off a bus with her family. Suddenly, the girl dived to the ground, sobbing. When he looked up, Chahabi realized she had mistaken a passenger jet overhead for a bomber. "It's not enough to move from one place to another," Chahabi realized. "War follows you." That 2015 moment was pivotal. Today Chahabi, 28, is a peer psychosocial counselor in Berlin, part of a growing effort to address the mental health needs of refugees in Germany. He works for a Berlin-based non-profit called Ipso cultural context. The organization provides mental health counseling for refugees in their native language, in the German capital and beyond. "He goes out and he's like a magnet," says Chahabi's boss, Maryam Gardisi. By training refugees as counselors, Ipso and other nonprofits here in Germany hope to fill a major hole in Germany's health care safety net. Recent studies estimate that just 4 percent of refugees, many suffering from post-traumatic stress disorder as well as trauma-induced anxiety or depression, have access to the mental health care they need. Ipso was founded in 2008 by a German psychoanalyst named Inge Missmahl. After working as a therapist in Afghanistan, Missmahl realized Western mental health concepts didn't always translate well — and that counselors familiar with the local language and culture would have a huge impact. 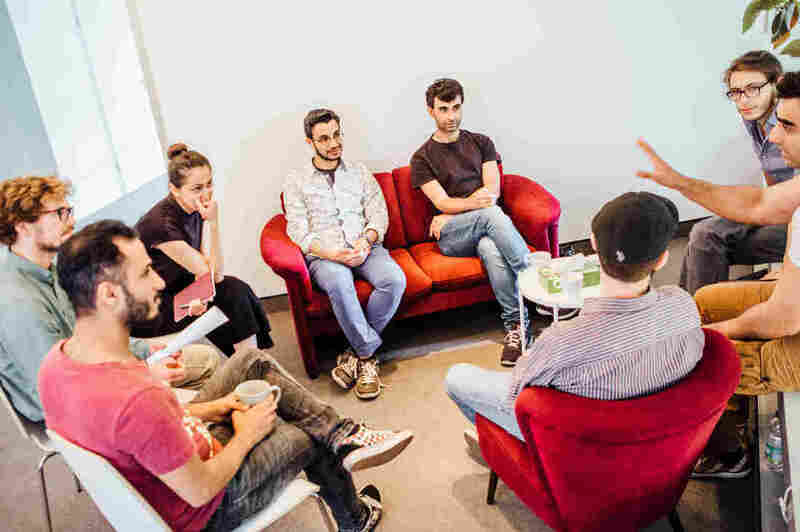 Since then, the organization — the name stands for International Psychosocial Organization — has helped train hundreds of counselors in Afghanistan, Haiti and Germany, with funding from the German government and private foundations. In 2016, it won a grant from Google as part of the company's Impact Challenge. In 2015, the organization started thinking about expanding closer to home. Hundreds of thousands of Syrians and other refugees were arriving in Germany, many fleeing conflict at home and traumatized by long and difficult journeys. "When people started arriving, we said, 'We need to do something here,'" says Ipso staffer Sophie Kortenbruck. Chahabi says he was at a low point when a social worker told him there was an organization looking for recently-arrived refugees interested in working as counselors. He certainly had relevant experience: He grew up in a Lebanese camp for Palestinian refugees. 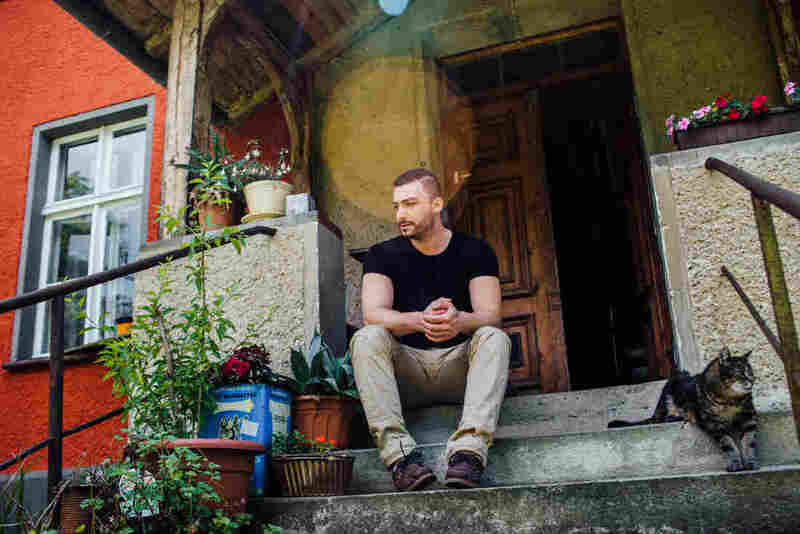 In 2006, he moved with his parents to Yarmouk, a refugee camp in the Syrian capital of Damascus, where some of his extended family owned an electronics shop. Chahabi at the house in a leafy suburb of Berlin where he has a studio apartment. After nearly two years, he feels at home in the city. Along the way, he picked up fluent English, along with French and Italian. "I was born in a refugee camp," he says. "I don't take being a refugee as a stigma. But I can understand the pain it causes for other people." When war broke out in Syria in 2011, Chahabi fled once more. He spent four years moving back and forth between Lebanon and Syria, finally leaving for Germany in the fall of 2015. Wherever he went, Chahabi says, he tried to pitch in — using his language skills to translate for other refugees. Still, Chahabi's first few months in Germany came as a shock. After days in line waiting for paperwork he was assigned a bed in a chaotic, overcrowded refugee shelter. He lost weight and developed painful stress-related rashes. "I was thinking, it's weird that I can't choose my roommate. It hits your self-esteem quite hard," he says. "I started to realize, if I want to do something good I need to get out of here." Armed with a doctor's note saying he needed a single room for health reasons, he was transferred to a shelter at the other end of Berlin, an hour's commute by train and bus from the center of town. Living in a converted office building that once belonged to East Germany's Stasi secret police, he found that the relative calm and surrounding greenery were just what he needed to get back on his feet. He stayed busy taking German classes and helping translate for the shelter's lone social worker. After four rounds of interviews, Chahabi was picked in the fall of 2016 as one of Ipso's first class of Germany-based counselors. His training included three months of all-day classroom work, learning about everything from confidentiality to trauma and addiction. The counselors talked about their own experiences, too. That was transformative. "I needed someone to see me and what I was going through," Chahabi says. Chahabi, photographed in his kitchen, uses this tablet for remote counseling sessions with refugees. A year and a half later, Chahabi lives in a bright studio of his own just down the road from the shelter. He's got the beefy torso and biceps of a weightlifter, and his kitchen counter is crowded with protein powders and five dozen eggs. He's now a salaried employee of Ipso and works five days a week, talking to refugees calling from refugee shelters in Germany and camps in Lebanon via a secure video link on his laptop, or in person at Ipso's headquarters in an airy former architect's office in Berlin. After nearly two years in Berlin, Chahabi feels at home: "I can find myself here, and I would love to stay," he says. "Now it all fits." Many of his sessions involve motivating people and helping them making sense of new lives in Germany. Regardless of their accomplishments or abilities back home, they're starting from scratch. "In Syria, they were famous surgeons, school principals, leaders of their community," Chahabi says. "Here they're just another refugee. People leave behind a lot of dignity." He tries to remind them of the resources they still have — and that they're still the same strong, resourceful people inside. Language is a huge barrier for the newly arrived. Because Germany's health insurance system doesn't generally cover translation, refugees who do find a counselor or therapist might not be able to participate in a session. By training refugees, Ipso is able to offer counseling in more than a dozen languages, from Arabic to Tigrinya, Somali, Pashto, French and English. Video counseling sessions work over a specially-designed private link. Originally developed to reach people in far-flung Afghan villages, the video system has proven popular with people afraid to be seen going to a mental health clinic, or women who can't easily leave their homes for cultural reasons. The system can connect counselors with patients anywhere in the world: Gardisi says one recent client was an Afghan refugee in Indonesia, talking with a counselor based in Berlin. A lot of Chahabi's work involves convincing people to open up. Mental health problems, he says, are stigmatized in many of the cultures that refugees come from. People are afraid to ask for help, and refugees often worry counselors might be reporting on them to the managers at the shelter or to the government agencies with the power to grant them asylum or not — and that they bring with them a fear and mistrust of authorities and government from the places they're fleeing. When meeting people in person, Chahabi is careful to explain that their conversations are confidential. "I tell them we are separate, that we are nothing to do with the government or shelter," he says. "You're a person and went through a lot of things, and I did too. We're both people." Sometimes just a few sessions are enough to get people back on track. "Once you learn to tell your worries to a counselor and see it didn't hurt you, you might have the confidence to open up to friends the next time," says Chahabi. "It's part of my job to motivate people to go on in their lives." Behind one of the first doors Chahabi knocked on was a man who hadn't left his room in four months. Paralyzed by concern for the son he'd left behind in Syria and uncertainty over whether German authorities would allow his family to be reunited, the man was reduced to waiting for the mail, hoping to hear from the authorities about reunification. "When he saw someone was coming to help him and support him in his own language, he started crying," Chahabi says. "It's so easy — if you can get them to trust you, you tell them to speak and they will let it all out." Andrew Curry (@spoke32) is a journalist based in Berlin, Germany, and a 2016-2017 Rosalynn Carter Mental Health Journalism Fellow.